When Roger Federer's lunging mishit spun high into the air and turned into a glorious lob, Lukas Lacko must have known it was going to be one of those days when he might as well enjoy having the best view in the house. 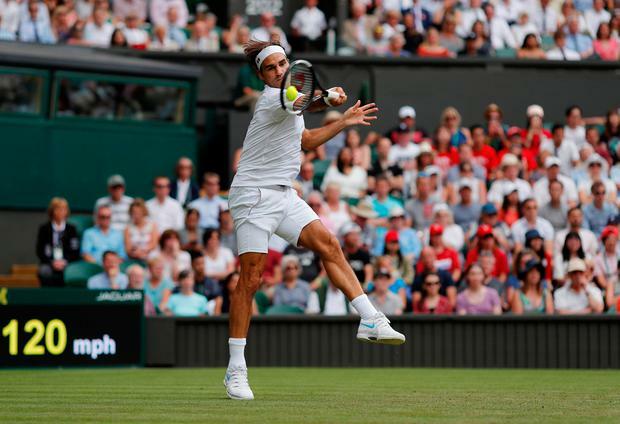 The Swiss champion was at his breathtaking best as he crafted 48 exquisite winners during a 90-minute masterclass that seemed more an exhibition of his shot-making than a charge towards a record ninth Wimbledon title. When Federer turned up to defend his crown in 2013, he suffered a shock second-round humbling by Sergiy Stakhovsky. There was no danger of a repeat performance yesterday, however, and a forehand swish on match point gave the top seed a 26th consecutive set at the event. Unfortunately it was the Slovakian who was left dodging the majestic missiles that were relentlessly raining down on his half of the court. The top seed belted down 16 aces, hit the target with 70 per cent of his first serves, dropped only three points on his first serve and did not even come close to facing a break point. His next opponent, Struff, outlasted big-serving Ivo Karlovic in their second-round match to win 6-7 3-6 7-6 7-6 13-11 in three hours 54 minutes. The pair sent down a combined 92 aces in the marathon contest on Court 15, with Karlovic accounting for 61 of them. Milos Raonic, seeded 13th, was made to work hard against Australia's John Millman before prevailing 7-6 7-6 7-6 in two hours 38 minutes on Court Two. The Canadian made 39 unforced errors to Millman's 18, but also turned up the heat when he was required to, firing 67 winners, including 34 aces, to advance.